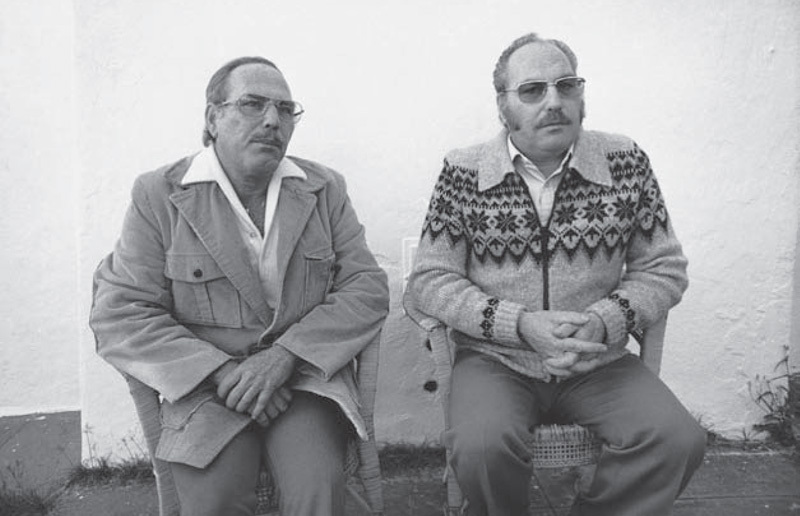 Oskar Stohr and Jack Yufe were identical twins, separated shortly after birth. Oskar was raised as a Catholic and a Nazi. Jack grew up as a Jew. These were two men with the exact same genes–they shared the same egg in their mother’s womb, and they now shared the same DNA. At the time they were born in 1933, their Jewish father and German mother were close to divorce. Within six months, the mother left for Germany, taking Oskar with her, leaving Jack with his father in Trinidad. They met for the first time shortly after turning twenty, though they had each known about the existence of a twin for years. Taking his wife with him, Jack booked a flight from his home in the Carribbean to Frankfurt where Oskar lived. It was an awkward meeting of strangers. They knew nothing about each other, yet Jack was staying at Oskar’s home for a week solely because they happened to share the same genes. It soon occurred to them that despite their genetic equivalence, they were not going to get along. For one, there was the language barrier: Oskar spoke German, Jack spoke Yiddish. Although this took place about a decade after the Second World War, Oskar still had to hide his Jewish lineage, as his current step-father was an anti-Semite. Jack was offended by this; he was raised as a Jew and found no reason to conceal this fact. The twins split up again at the end of the trip, becoming little more than acquaintances. They had not learned much about each other, save for the fact that they were physically similar. For twenty-five years, there was almost no contact between the two, until one day in 1979, when Jack came across an article about the “Minnesota Twins Study”. The Minnesota Twins Study was being conducted by Thomas Bouchard at the time. Bouchard was studying twins who were separated early in their lives and brought up in different environments. This struck a chord with Jack–he thought of the study as a good way to try to develop his strained relationship with his twin. Jack contacted Bouchard, and Bouchard soon brought the two together in Minnesota. This time, almost immediately after meeting, their incredible similarities started to become apparent. When they arrived and met at the airport, Jack and Oskar both wore wire-rimmed glasses, mustaches, and two-pocket shirts with epaulets. Over the course of the week-long study, the two men discovered that they had much more in common than they had thought twenty-five years prior. They both liked spicy foods and sweet liqueurs, dipped buttered toast in their coffee, and flushed the toilet before and after using it. They both excelled at sports, had trouble with math, and had tendencies to fall asleep in front of the television. They even had the same habit of storing rubber bands on their wrists. They discovered an even more extraordinary similarity one evening when they decided to visit a hypnotist together. The hypnotist, starting his routine, waited for absolute silence in the room before counting backwards to attempt to induce a trance. During this silence, Oskar felt an incredible urge to sneeze, and let it out in a deafening blast. But it wasn’t a real sneeze. Oskar faked it. His wife soon explained that it was his idea of a joke. He liked to sneeze during uncomfortable silences. Jack was taken aback–he had the same tendency. Whenever he was in a crowded elevator filled with the air of awkward silence, he felt the same irresistible urge to fake a sneeze. He found it humorous and thoroughly enjoyable, though he knew it was an odd thing to do. And now, he found out, his twin had the exact same oddity. How could these identical twins, growing up for five decades in drastically different environments, be so, well, identical? Are our genes largely responsible for the personality traits we develop? This one anecdote is certainly not enough evidence on its own, but many pairs of separated identical twins have been studied over the years. Nancy Pederson and her fellow researchers, in a study of 99 separated identical twin pairs and 200 separated fraternal twin pairs, made several observations. For one, separated identical twins are understandably less similar than identical twins raised together. However, age of separation, degree of separation, and the time spent apart did not seem to affect the difference between twins’ personalities. From this, it was suggested that a child’s early rearing environment had little impact on personality. In other words, our genes do seem to play a significant role in shaping our personalities, even later in life. Further supporting this idea, Nancy Segal found that virtual twins (children of a similar age who are raised together but biologically unrelated) are also quite dissimilar, despite being raised in the same environment. This might explain why siblings in the same family can turn out to be extremely different. As siblings only share half of their genes, their genetic differences may play a larger role than their upbringing in shaping their personality. This is not the only possible explanation, of course. It could be that siblings simply have very different life experiences outside of home–different friends, different education, different hobbies–which shapes them into who they are. Or, perhaps siblings are, in a strange twist, influenced by each other, in such a way that they each encourage the other’s differences. Research is still young in this area, but current studies do seem to point to the idea that a shared environment has little impact, at least on certain personality traits such as extraversion and “agreeableness”. Then, you might wonder, is parenting or adoption useless? Do our environments shape us at all? Let’s look more closely at the case of Oskar and Jack. Do they have any differences? Well, for one, they had opposing political views–Jack is politically liberal, Oskar is conservative. These contrasting values certainly played a role in their relative ambivalence towards each other when they first met. Our political views and values do appear to be strongly affected by our upbringing, as do our attitudes and religious beliefs. These are aspects of a child that a family environment can often influence. Although the effects of a shared environment are relatively small, we cannot say that genetics are the only factor contributing to our behavior. Even so, the specific aspects of our environments that shape us are still not clear; the research is continuing to evolve. We often like to think that our experiences are what define us. We feel influenced by our surroundings, and we feel that we can influence the things around us through our personality and behavior. But as evidence suggests, our experiences and upbringing may only account for some smaller piece of our personal identity. Perhaps, at the very moment we exit our mother’s womb, nature has already made many decisions–decisions about our personality, our behavior, and our lives. Pedersen, Nancy L., Robert Plomin, Gerald E. McClearn, and Lars Friberg. “Neuroticism, Extraversion, and Related Traits in Adult Twins Reared Apart and Reared Together.” Journal of Personality and Social Psychology 55, no. 6 (1988): 950–957. doi:10.1037/0022-3514.55.6.950. Plomin, Robert. “Commentary: Why Are Children in the Same Family so Different? Non-shared Environment Three Decades Later.” International Journal of Epidemiology 40, no. 3 (June 1, 2011): 582–592. doi:10.1093/ije/dyq144. Segal, Nancy L., and Scott L. Hershberger. “Virtual Twins and Intelligence: Updated and New Analyses of Within-family Environmental Influences.” Personality and Individual Differences 39, no. 6 (October 2005): 1061–1073. doi:10.1016/j.paid.2005.06.013. Shaffer, David R. Social and Personality Development. Cengage Learning, 2009. Turkheimer, Eric, and Mary Waldron. “Nonshared Environment: A Theoretical, Methodological, and Quantitative Review.” Psychological Bulletin 126, no. 1 (2000): 78–108. Wright, William. Born That Way: Genes, Behavior, Personality. Psychology Press, 1999.